With just five weeks to go before the Welsh Assembly elections there’s a new YouGov poll out which suggests that Labour is on target to win an overall majority. As the table shows there’s very little movement for the red team over the past four weeks. The Welsh Lib Dems will take some heart from tonight’s numbers which have them moving up from 5% in the regional vote to 8%. The loser, if that is the right term, is PC which looks set to be down a fair bit on what was achieved in 2007. One estimate suggests this would work at CON 13(+1): LAB 33 (+ 7), LD 5 (-1): PC 9 (-6) â€“ thus giving Labour an overall majority. Did yesterday show that Ed Balls should be leader? Will Cameron’s insult help his chances? Yesterday’s PMQ encounter between David Cameron and Ed Balls has continued to reverberate and I wonder whether it could have a long-term impact. For Cameron’s comments about Balls being ” the most annoying” is a tag that looks as though it will stick but I don’t think it will harm Balls – rather the reverse in fact. He, yet again, showed himself to be the most robust attacker of the Tories and the coalition and in opposition that’s a pretty good reputation to have. “.. Iâ€™m even more convinced that the only one capable of being an effective leader of the opposition is Ed Balls. Heâ€™s sharp, shameless and a fighter. One response last night said it all. The five were asked to say who their favourite former Labour leader was. Balls, who was Brownâ€™s comrade in arms for so long, replied â€œTony Blairâ€. I’ve no idea when there will be a contest for Labour leader but when it comes Balls should be in with a good shout – yesterday’s attack by Cameron will help him. Ladbrokes has Balls as the 8/1 third favourite. His wife, Yvette Cooper, is at 3/1. What’s the Scottish Sun going to do for May 5th? Will Murdoch’s paper once again say don’t vote SNP? Almost whenever you talk to someone with a close interest in Scottish politics the above front page from the Scottish Sun on the day of the last election to the Holyrood parliament in 2007 will come up. 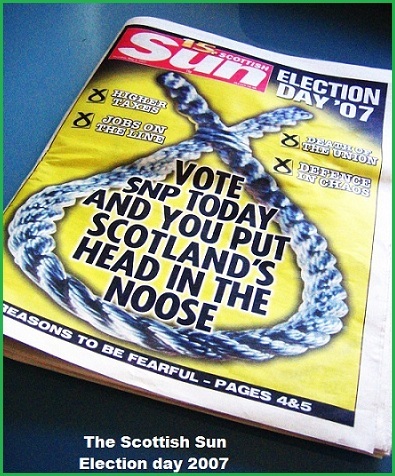 This was powerful because adapting the SNP logo into a hangman’s noose sent a clear message to voters of what it wanted to happen. As it turned the result was much tighter than many expected and some would argue that the Scottish Sun helped Labour. So what’s the paper going to do this time? 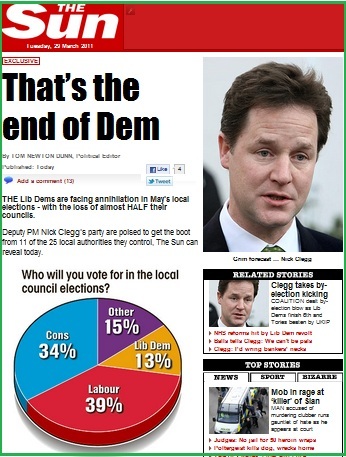 After abandoning Labour nationally in September 2009 the Sun is hardly going to make an exception for its Scottish edition – but there’s no way, surely, that it’ll back the Scottish Tories? I know that many SNP supporters are hoping that Rupert Murdoch’s paper might turn its 2007 position on its head and go with the nats. Will it go so far and does it matter? To the former the answer is “possibly” and to the latter the answer is almost certainly yes. In the past few days I’ve built up a reasonable betting position on the SNP because to my mind the odds are out of line with the chances of success. I’m postponing further investment until the Scottish Sun’s position becomes clear. Betting prices: Ladbrokes have the SNP at 7/4 with Labour at 2/5. At Bet365 you can get 9/4 against the SNP with Labour at 1/3. 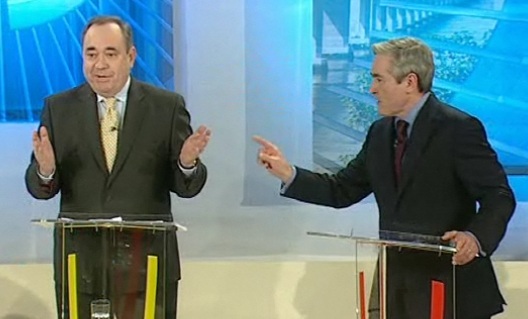 One or two other bookies have slightly better SNP odds but they don’t accept my bets. Will Northern Ireland count double in the referendum? Will we get polling from the high turnout province? In almost all the discussions on the May 5th referendum nobody seems to be considering that part of the UK that almost always has the highest turnout in elections of all kinds – Northern Ireland. For on the same day there are the elections to the Northern Ireland Assembly where, four years ago, the turnout exceeded 63%. If that’s repeated it could easily be double the overall average turnout level for England which means that the province looks set to have a disproportionate impact on the overall referendum outcome. England will be divided into two on referendum day: one part where there are local elections taking place at the same time with a turnout level in the high 30s; the other part, including London, has no simultaneous elections and it’s hard to see levels of participation exceeding 25%. Now for those trying to predict and/or bet on the result Northern Ireland presents a problem – for the standard polls that we see do not cover the province. Because the party and political structure is different in the province it is excluded from all the national voting intention polls. These are GB only – that is England, Wales and Scotland. The same has applied so far to the AV polling. Today I sent a round robin to the major pollsters asking if this polling gap was going to be covered. Their response is that it would be if one of their clients was prepared to fork out and pay the extra costs. What are the chances of that? I wouldn’t be too hopeful. There’s another element in all of this – what if opinion in Northern Ireland is particularly for one side or the other could it be that it’s extra voting power could change the result? If that happens I can see a lot of post May 5th rows about the validity of the election.